I’ve been very excited and wrapped up with the moths I’ve been catching in the last couple of weeks, but they’re not the only lepidopterans the warm weather has brought out. 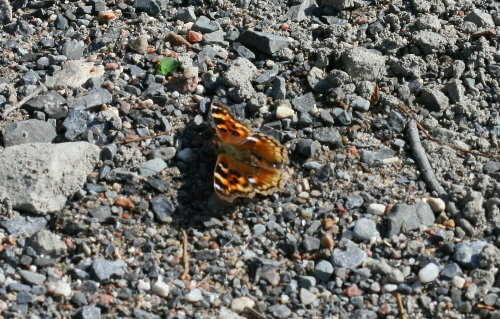 On the same lovely, warm day that I encountered the Infants, I also came across three butterfly species. The first, and certainly most abundant of these, was the above: Mourning Cloak, Nymphalis antiopa. From a distance and while flying, Mourning Cloaks look dark, almost black, and these shrouded robes give the butterfly its name. Up close, especially when sunbathing, it is a rich maroon, fringed with sky-blue dots and a soft yellow border – colours not usually seen in flight (except for the pale margin, which makes it easy to identify). Even the Kaufman guide to butterflies chooses not to show these bold colours, depicting the species instead as dark brownish-black with just a handful of brighter blue spots along the hindwing. Next time you see one sunbathing, take the opportunity to sneak up on it and peer closely. The colours are amazing. It’s found through nearly all of North America, except the majority of Nunavut and the high arctic, as well as much of northern Eurasia, where it is known as Camberwell Beauty. Older names for the species included Grand Surprise (I love this one) and White Petticoat. 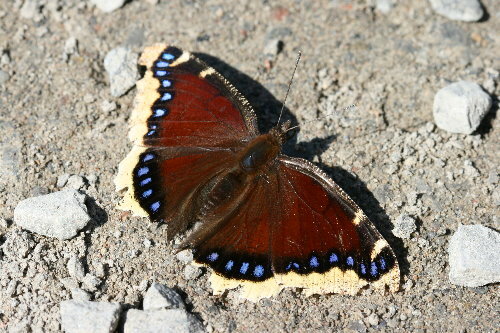 The Mourning Cloak is usually the first butterfly spotted on the earliest warm spring days. The species can be seen most of the year, except for the cold winter months. Adults emerge from pupae in the late summer, build up fat over the fall period, and spend the winter hibernating. They emerge early in the spring, when the sun begins to warm the landscape and melt the winter’s snow cover, often looking a little tatty around the edges. Mating occurs in spring and early summer, and the larvae spend the summer developing and pupating before the cycle begins again. Because they hibernate as adults, they live longer than most butterflies, up to 10 months from their late summer emergence to their early summer death (if you can call their frozen torpor in winter “living”). 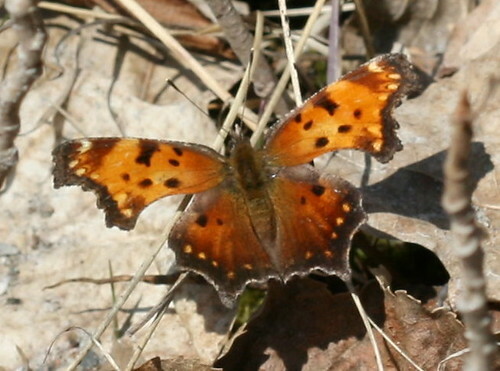 Another species that spends the winter as an adult is the Compton Tortoiseshell, Nymphalis vaualbum. Despite the difference in appearance, it is classified in the same genus as the Mourning Cloak. The similarity is clearer when the butterflies are viewed from the underside. They have a similar range as the Mourning Cloak, occurring in both the Old and New Worlds, but their distribution is more restricted, found neither as far north or south. In North America, they are generally associated with dense woodlands of Canada and New England, but sometimes stray some distance beyond this narrow range. Last spring was the first year that I observed this species, even though they’re not uncommon, and I had been paying at least casual attention to butterflies for years. I suspect I may have passed many previous observations off as being of Painted or American Ladies, which look similar. These latter species actually migrate south for the winter, as they can’t tolerate prolonged freezing temperatures. I only realized that what I had was different when I got home and examined the photos I had taken that day. It took me a while to identify it because the photo in the Kaufman guide is significantly darker than the individuals I’ve seen, however the white spot at the leading (top front) edge of the hindwing is diagnostic. This isn’t a great photo of it; the individual I saw was very flighty, and wouldn’t let me get close. While I expected to encounter the previous two species, this one was a surprise to me. It’s an Eastern Comma, Polygonia comma, in the same taxonomic tribe but a different genus from the other two above. I had never seen a comma (or its close relation, the Question Mark) this early in the spring, but it shouldn’t have surprised me so. Yet another group of species that spend the winter hibernating as an adult, commas apparently occasionally come out on warm winter days, though I’ve never seen one do that here. Eastern Commas have two colour morphs, a dark and a light, which occur according to season. The winter/spring morph is the light one, with the summer/fall individuals having dark hindwings. The group is named for a silvery comma-shaped mark on the underside of their hindwings, which otherwise look like a dead leaf or loose piece of bark when folded closed. The Question Mark looks almost identical from above, and is most easily distinguished by the addition of a small silvery dot at one end of the comma, which gives it its common name. The Eastern Comma is interesting in that it doesn’t often visit flowers for food, but rather feeds at sap drips and rotting fruit, supplementing these with minerals obtained at mudpuddles or dung. I’m now up to a couple dozen species of moth, and three species of butterfly, so far this spring season, and the season has barely started yet – we’re not even at April! I am constantly amazed at the circumstances that landed us here, in this location, and give thanks that we’re lucky enough to call such a place home. Look at that maroon! We’ve been out looking for The Infant (your post encouraged us to seek them out near birches), but still no luck — maybe the fact that it’s now ice-storming out has something to do with it. Is everyone else getting spring except for us? We thought it had arrived yesterday, but . . . The Infants can really be hit-or-miss, Kenton and Rebecca, and I think we’re particularly lucky to have so many of them in our area. In all the years of living in the countryside at my parents’ old house, we only saw them once. Even here I’ve only seen them along the road, never in the forests. I’ve also tended to see them mostly on very mild sunny days where the temperature reaches at least 60 oF (15 oC) in the sun. They’ll be flying for at least the next month or more, so keep looking! Good luck with the hunt!